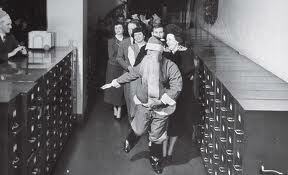 We’ve come a long way in corporate events since the office party Santa conga line. Still, even in the 21st century, often the most interactive thing at a gala party is the vermouth in the martini shaker interacting with the gin. For party planning pros, finding that special element to engage and delight party guests who swear they’ve seen it all can be daunting. Even more challenging is finding a way to deliver the message (product launch, fundraising goal, etc) in a way that is fun for guests but still memorable. Then along comes highresolution’s David Drucker with a bright idea: Augmented Reality for Events. Engaging, fun, interactive, a conversation builder and ice breaker, AR for events is a superb way to offer up your message without a podium, a video screen, and without stopping the action of your party. The ways to use AR for events are limitless, and the content can be as simple or elaborate as you like. You can create an app that interacts with everything from your invitations to your centerpieces to your silent auction items. You can show guests a 360 degree 3-d rendering of that nonprofit center their funding will help build, with callouts for donations to give a door, a window, a sink or a desk. You can incorporate instant sharing buttons right from the event to your guests’ social media pages – no more handing out little cards with the hashtag – your party has an app! 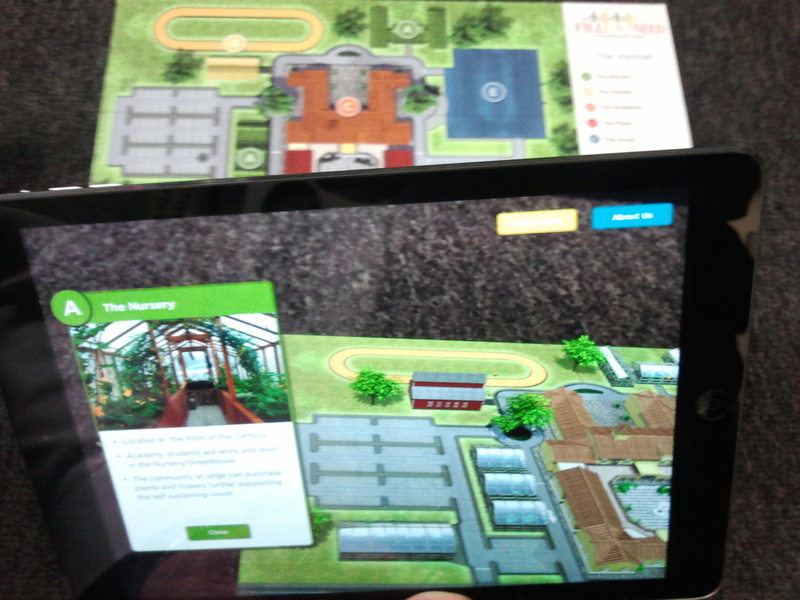 A guest uses an ipad to explore the future facility. 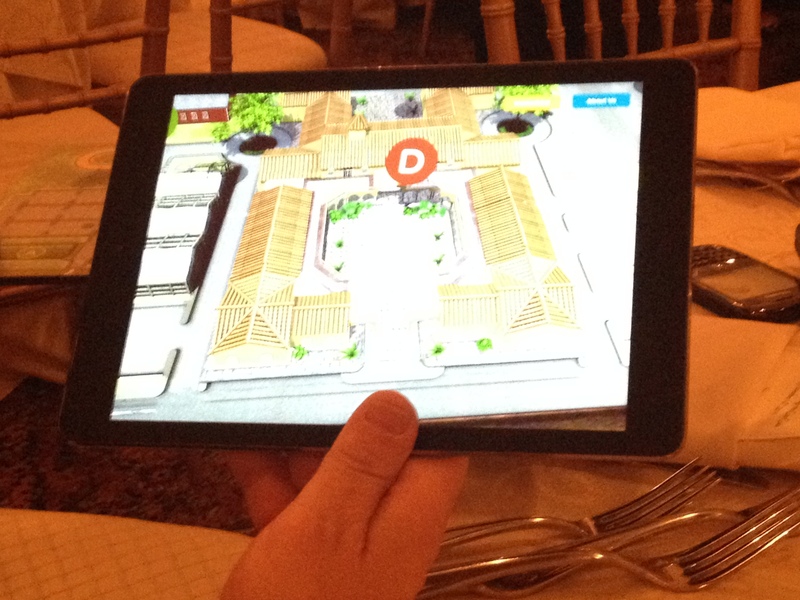 At the recent Fill-A-Need-Foundation gala at the Trump National, guests used highresolution’s customized Augmented Reality in table centerpieces. Rented ipads were loaded with the software in advance and placed at tables. The guests had an opportunity throughout the evening to point the iPads at the table centerpiece to see a 360-degree, 3-D rendering of the complex their donations are helping to build, complete with pop-up descriptions of each area of the project, from the equine therapy stables to the beautiful meadow and greenhouses that will offer services to adults with special needs for decades to come. The rendering comes alive in stunning 3-D and a swipe provides a 360 degree view. The Augmented Reality centerpieces made Fill-A-Need’s future project seem very real in the present moment, and guests were all the more motivated to participate in the evening’s various fundraising activities. If you need that very special tool or technique to enliven your next event, contact us and ask for a free, live demonstration of our AR for events. 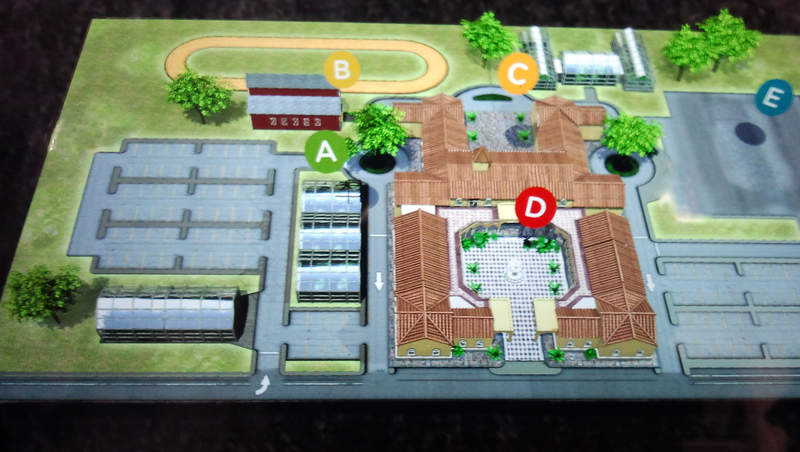 The iPad transforms the one-dimesional image into an interactive tour of the property.